Looking to buy your Cockatoo books that you may no longer need or want. I'll pay for P&P as well of course!! Failing that, any ideas on good books to buy? Most interested in behaviour related books, but will devour all..
Nina, have a look at www.mytoos.com. Invaluable info on there! To be honest, I wouldn't bother with books, cockatoos just don't stick to the rules. You'll find you've read the book, prehaps gleaned a little info, but most of it is general husbandry and care, or just plain common sense. If you have any specific questions, there are a few cockatoo owners on here, but when I was dealing with troubled toos, mytoos was my bible, some very, very knowledgable people on there. How's the ducorps settling in? Spooky - I was just on the mytoo site, been there before as they seem to know what they are talking about. I'll definately have a more proper read up now. I know, I know.. honeymoon period and all that. Hence my doubts and thoughts... I never been this torn before!! Am I right for him?? Do I have the knowledge and confidence? *pulls hair* Ohhh dear... lol. Nina, my first bird was a cockatoo. They aren't the terrors people make them out to be, nor should people say you shouldn't have one if you haven't got experience, because as with every bird, you will learn as you get to know them, and every cockatoo is different! They can't just be bunged into a "difficult bird" category, look at mine, yours and dis sennies, they can be terrors! they do seem to have a longer settling in period than a lot of birds, hence you will hear honeymoon period more with toos than other birds, you might find that in a couple of days he might try pushing his luck at things like stepping up, going back to the cage etc. Only you can know what your limits are though I'm afraid! The other thing I'd advise is to take what other people say about him with a pinch of salt. Listen, but don't take it as gospel, they aren't you, and what they might feel is a difficult bird, you may not, and vice versa! Plus a different environment can bring out a totally different bird! I agree with Holly, and Ducorps are lovely. Yeah each cockatoo are different dont waste your time on books the mytoos site is great. Its hard to not get to attached but it does sound like he is happy with you!! Our first 'big' parrot was an LSC and in those days he probably had been wild caught too. It took a long time to gain his trust but what a loving bird he turned out to be. Took him 8 years before he'd even try a piece of corn on the cob! 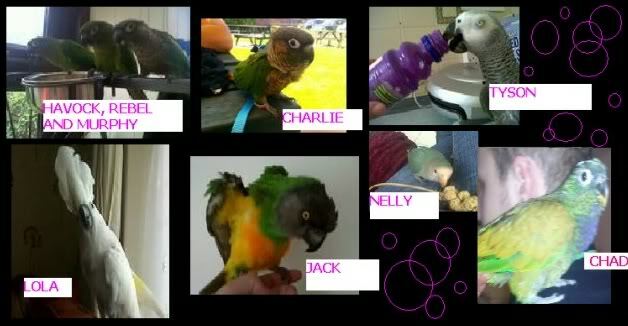 So yes I agree they are all different and you have to get to know your own bird. And yes Hollie, Sennies are definitely terrors! I am currently looking after a little Ducorps, slightly plucked, previous broken foot/toe that has healed incorrectly, has arthritis, 35 years that we can account for... The first time I have ever met one properly! Lovely little fella, I was told he was a nightmare bird for the previous people, wouldnt go in/out of cage, aggressive etc but so far he has been a little gem and no trouble at all, not attempted to bite once and certainly not aggressive! Loves the kids! He screamed more or less constantly for a few days, not full blown big Too scream, but more of a constant seagull noise! But now he has settled in a bit this has calmed down a lot. I hardly hear a peep out of him now. I will have a proper look at the mytoos site as well I think. It is so hard not to get attached, I have only had him here a week too. I'm wondering where the pics are ladies! The other thing I find useful with toos especially because they are bloody fast when they do bite, is watch the bird, not your hands! I watched your vid of him on fb michelle, he looks looooovely! Can I haz cuddles please? Thank you all for your advice, I'll give you an update tomorrow, I've ran out of internet time for today. Need to start making dins for 4 birds and a hubby!! I love Too's, they are quite easy to read you know? People say they are not, but you get used to their little ways. And I'd say, if he's taken to you already, you are winning! they do love their cuddles don't they? Nina cant you keep him! Sunday morning, when me and Bubba was having a cuddle, my OH looked at us and just sighed. I asked him what's up and all I got as an answer was: "You'll figure it out". Ummm ok, cheers for that! Yesterday evening I popped the question.. would he be ok with me adopting Bubba. He just laughed and said: "Hunny, I already knew you would, it was just a matter of time. Hence why I sighed the other day, 'cause I knew I would have to save up to a new cage!" He know's me better than I do, I suppose! LOL. Well, last night I sat down and wrote my application. Now all I can do is keep my fingers crossed and hope... Bubba has been without a home (believe it or not) for 2,5 years... It's about time he came home, for good. Ohh good luck Nina, it sounds like he's chosen you as his new mum. Aww if he`s happy and settled then surely it would be a crime not to let you keep him! All you can do is pray they actually do right by the bird!!!! what a statement.......you do know there is nowhere better than where he is now don't you? And don't forget about your own happiness either....it does count you know! It's quite a common statement that I've heard so many times Nina! It means, 'I want this bird to stay here because no one can care for it as good as I can'!!! That's what goes round my brain anyway, and if a bird touches your heart so much, then it would be criminal to remove it! I hope you got to keep bubba, he seemed so happy with you! I see there are 2 more ducorps on the adoption list, I want em! its no good the husband is gonna have to go!!!!! Sorry for the late update to the thread! Bubba has got himself a LOVELY home, and I mean that, I've seen 'em together and he loves them and they love him! Fantastic in my opinion, Im so happy for him!